The Diplomat speaks with New Zealand Defence Minister Wayne Mapp about China, regional strategy and peacekeeping. This year saw the third China-New Zealand Strategic Consultation between the armed forces of the two nations. In what ways has New Zealand been working with China’s armed forces? There are multiple levels to that question. The first and probably most important relationship we have is the security dialogue, which is really about the understanding of what you might call the security architecture of the Asia-Pacific region. New Zealand has an interest, as do other countries in the Asia-Pacific, in the region evolving in a predictable and stable way. The growth and prosperity of the last 50 years is totally dependent on that, and by and large, the conflicts that existed 50 years ago no longer exist. As a result of that, we’ve had this enormous growth in trade and prosperity, and that’s underpinned by the understanding and relationships between nations in the region, some formal and some informal. The more specific defence force issues have been based more around humanitarian assistance and disaster relief and this looks to be a growing area of interest to defence forces in the region. The second element is involvement in peacekeeping operations. China is really a new entrant into this field—they say about 15,000 personnel have been deployed over a period of about 10 years, which is an extremely small percentage of their defence force. As a result, the PLA hasn’t been historically honed to that role and they’re having to learn it. In addition, there’s also an area around maritime security generally. 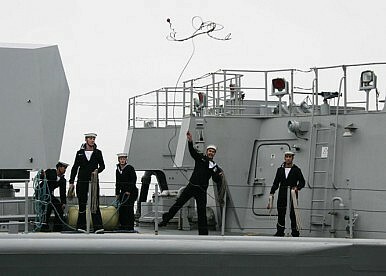 There have been a number of naval visits from New Zealand to China. We only have a small navy, but they really do get out and about. Australia is obviously a key ally for New Zealand, but in its defence white paper last year it indicated it saw China as a potential threat. How does New Zealand see China’s military rise? It’s inevitable that China will have a greater role in the region. Bear in mind also that they are now New Zealand’s second-largest trading partner, and I think Australia’s largest trading partner now. China’s growth has been profound, and since New Zealand has had a free trade agreement with China we’ve had spectacular levels of growth in trade. So clearly, China is going to take a deeper interest in the regional architecture and also the stability of the region. You can’t have trade, growth and prosperity without stability, and so their defence forces have been growing in the past few years. But as a percentage of their GDP, and if you look at the number of people involved, it’s actually a relatively small defence force, and certainly historically its been a very inward-looking one. Certainly as they’ve become more outward-looking in trade and investment, their defence forces have also become more outward-looking. But everyone’s interest is that this evolves in a way that benefits everyone. That’s why I think the ASEAN Plus 8 meeting, which is effectively the first formal meeting of all the defence ministers in the region, is very valuable. What would you say New Zealand has to offer in terms of security in the Asia-Pacific? We’re a country of four million people, though sometimes I think our partners think we’re a country of ten million. And I guess there’s a reason they often think that, and it’s because New Zealand is an internationally engaged nation, irrespective of who the government is. It’s a fundamental feature of who we are, because of our origins, our history, our trade.